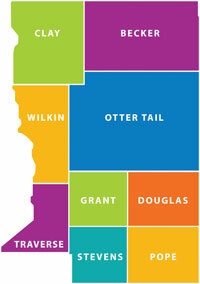 West Central Initiative serves the counties of Becker, Clay, Douglas, Grant, Otter Tail, Pope, Stevens, Traverse and Wilkin, and is the area designated as Minnesota's Economic Development Region IV in west central Minnesota. We are west central Minnesota. The region encompasses 8,615 square miles and measures approximately 125 miles between its northern and southern boundaries and 85 miles east to west. The region is bounded on the west by North and South Dakota and is approximately 150 miles from the Minneapolis-St. Paul metropolitan area. The region is essentially rural with most communities having populations less than 1,000. According to the 2010 Census and Minnesota State Demographer data, the estimated regional population was 223,455 and the population continues to increase. The largest city in the region, Moorhead, has a 2012 population of 39,039 and is part of the Fargo-Moorhead Metropolitan Statistical Area. Other major cities in the region include: Fergus Falls (13,215), Alexandria (11,549), Detroit Lakes (8,812) and Morris (5,277).The region is served by Interstate Highway 94, U.S. Highways 10, 59 and 75, as well as numerous state highways. Approved more than 10,000 grants totaling $53.3 million. Provided more than 1,000 loans to businesses in excess of $49.6 million. Contributed nearly $102.9 million to the region in support of programs. Created and retained more than 7,800 jobs. Leveraged more than $244.3 million in loans to regional businesses. Established 84 component funds with combined assets exceeding $21.6 million. Developed a WCI general endowment fund in excess of $34 million.